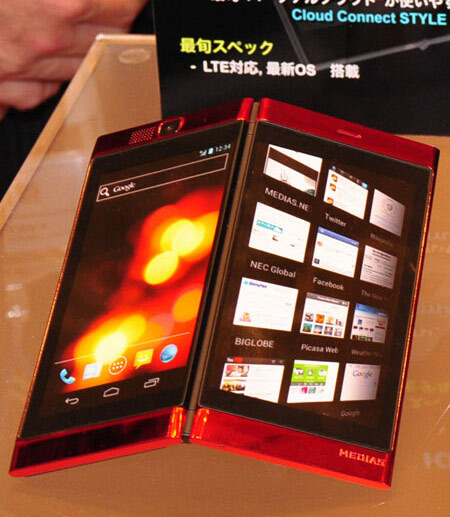 NEC Casio has announced the smartphone to market Thailand “MEDIAS” company. In addition, three species exhibited in MWC2012 concept model for the global. In the country has implemented the “strength made” by the restructuring, the development of products that enhance the power. NEC Casio Mobile Communications has announced that the meeting at product launch was held on February 22, Thailand to market, the “MEDIAS” of the company’s smartphone. Through a local distributor, will be released in April. In addition, also been revealed for the global model currently in development that is proposed to telecom operators in each country. These, combined with the toughness model was announced at the CES, to exhibit at “Mobile World Congress 2012″ held in Barcelona, ​​Spain. The two-fold two-screen terminal of the body to consider the use of cloud services. Cloud Connect and selectively used different styles to show the screen to the keyboard input style to style smartphone tablet style of folded state, large-screen, one side, with left and right, the four styles.